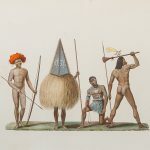 [SPANISH COLONIZATION OF THE PACIFIC] Relacion de la Vida de el Devotissimo hijo de Maria Santissima, y dichoso Martir Padre Luis de Medina, de la Compañia de Iesus, que murio por Christo en las Islas Marianas (llamadas antes de los Ladrones) con otro Compañero seglar, llamado Hipolito de la Cruz. 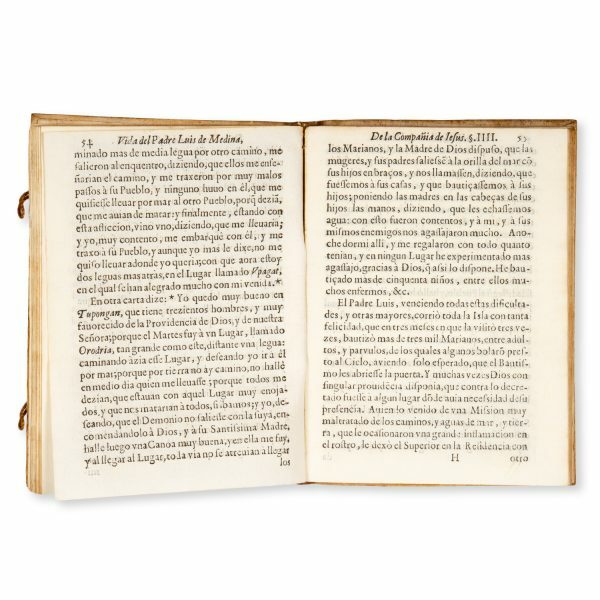 En Madrid : con licencia de el Ordinario, 1673. Quarto (197 x 142 mm), contemporary vellum, spine lettered in ink (faded), ties partially remnant; ff [1 blank], title leaf with early inscription and stamp of the Collegium Bareinonense Societatis Iesu, pp 146; text block starting to loosen, two pages with light soiling (one with short edge tear repaired), else clean and fresh, a fine copy overall. 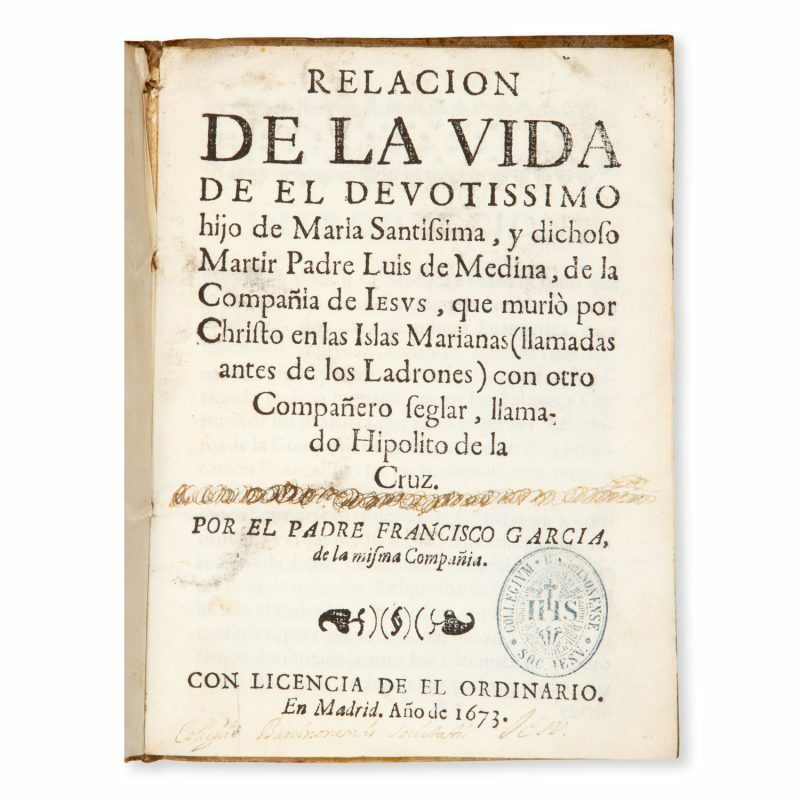 Rare first edition of this important biography of one of the earliest missionaries to the Marianas Islands, Father Luis de Medina (1637-1670). A very early source on the Spanish colonization of the Western Pacific. The mission in the Marianas (Ladrones), established with the arrival of San Vitores, Medina and four other Jesuits in June 1668, was the first Spanish mission in Oceania, and was intended to serve as a stepping-stone to further Spanish exploration and settlement in the Pacific. Father Medina would become the first missionary martyred there, when he was murdered by a group of armed Chamorros on the island of Saipan in January 1670. San Vitores himself would be martyred not long afterwards, on Guam in 1672. This Relacion was published the same year as the Exemplar vida y gloriosa muerte … del P. Luis de Medina de la Compañia de Jesus. 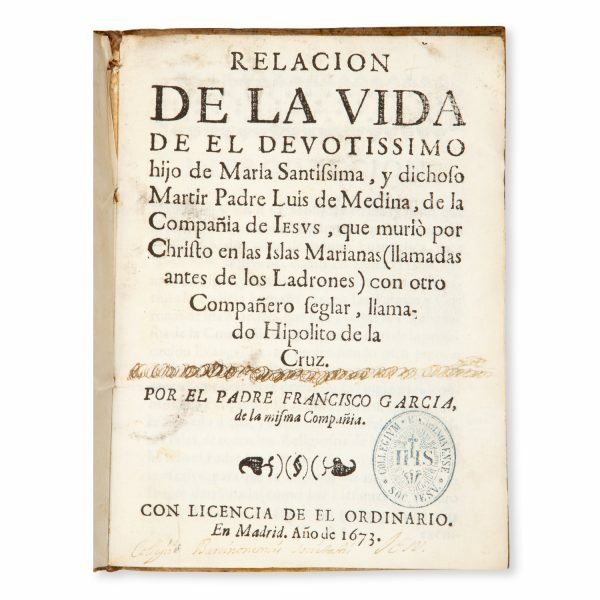 Que passo a la conquista espiritual de las Islas de los Ladrones, que oy se llaman Marianas, an account which was extracted from San Vitores’ papers. It is, therefore, a fully contemporary and reliable narrative of the earliest period of Spanish settlement in the Pacific, containing much detail regarding the often violent resistance the Spanish encountered from the indigenous population, the Chamorros. Through its account of the voyage to the Marianas, the Jesuits’ missionary activity, and the martyrdom of Father Medina, the work provides a record of the first Spanish attempts to colonize the Pacific, as the proposals promulgated by both Quiros and San Vitores in their writings were put into action. 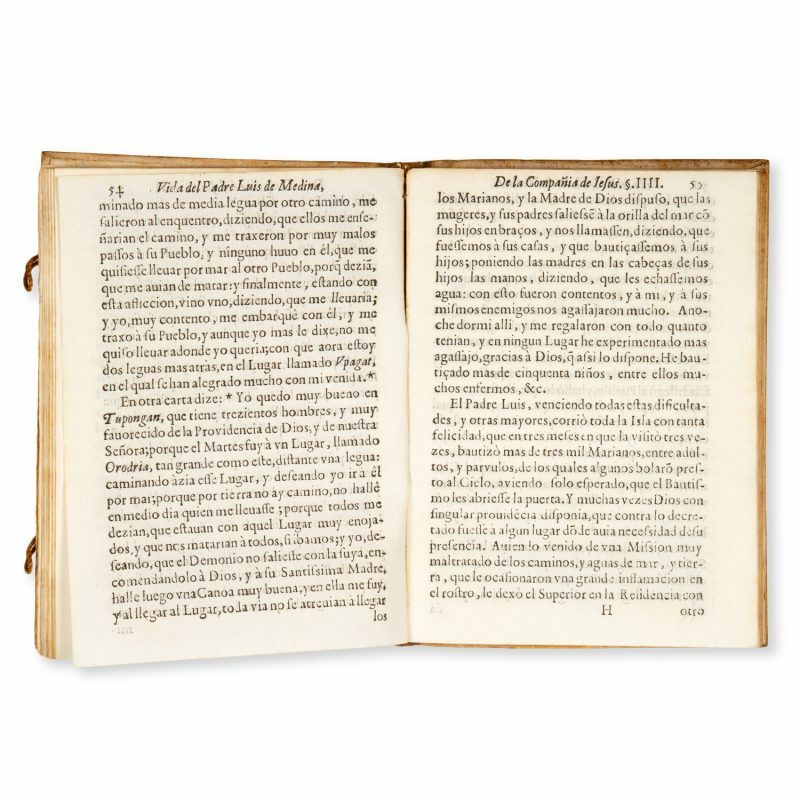 Unrecorded in Australian collections; OCLC locates copies at BNE and Biblioteca de la Universidad Complutense; a copy is also held in the Universitat Rovira i Virgili (Tarragona). 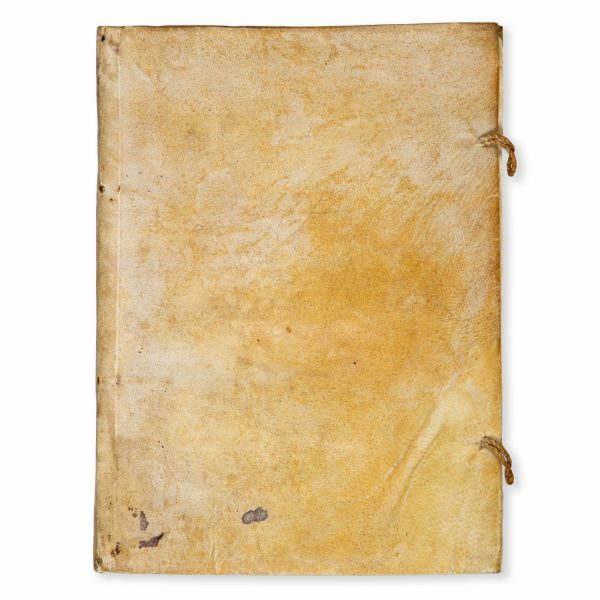 Only one copy at auction in at least the last 50 years, according to RBH (Sotheby’s, London, 1977).